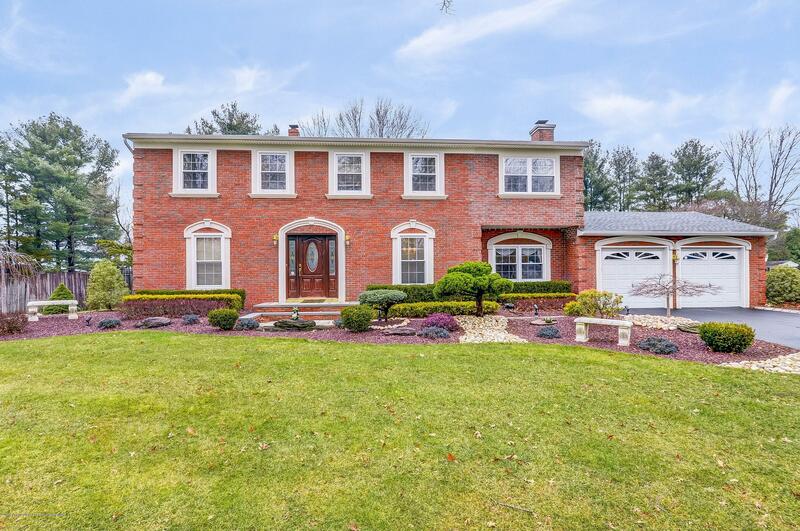 Immaculate Center Hall Colonial in highly sought after Whittier Oaks South of Freehold Township. This elegant, Brick front home features 4 bedrms, 2.5 ba, finished basement and 2 car garage. Fully fenced in yard w jerith gates, paver patio and flat property! This home will not disappoint with beautiful maple kitchen cabinetry, plenty of recessed lighting, marble flooring, step down family room w sliders to yard. Family room includes woodburning fireplace. Generous sized bedrms w Hardwood flooring! Master bedrm w pocket doors and Masterbath. Custom window treatments. New Washer & Dryer. New Heating system 2018. Also included is alarm system, plenty of recessed lighting thru out, crown molding and Belgium block double driveway. Manicured landscaping adds to the curb appeal! Hurry!